Announcement 🌺 Knitter’s Serendipity by Damselfly Studio 🌺 Knitting Notions designed for Knitters, by a Knitter. Knitter's Serendipity features beautifully crafted Stitch Markers for Knitting and Crochet inspired by 1950's Vintage beaded jewelry. 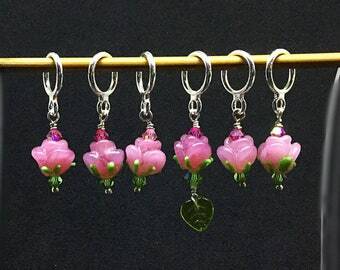 Serendipity Stitch Markers are snag free, made from quality jewelry findings, Glass, Crystal and Vintage beads. 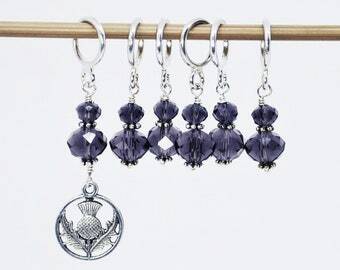 Serendipity Stitch Markers are available in 3 sizes plus Crochet. Serendipity Stitch Markers are a joy to use, as they glide across your needles, Your WIP's (Work In Progress) will attract a lot of attention! Please "Like" my Facebook Page, where you can post pictures of your Works In Progress, find out about new products, discount coupons, ask questions and more! 🌺 Knitter’s Serendipity by Damselfly Studio 🌺 Knitting Notions designed for Knitters, by a Knitter. 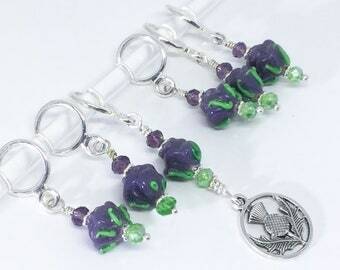 Purple/Green glass bead stitch markers for knitting and crochet, Stitch Marker set gift. 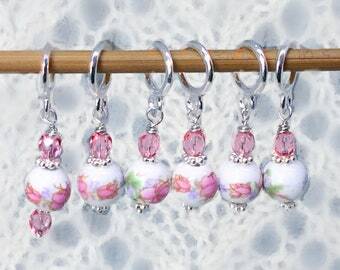 I am beyond delighted with these stitch markers and am about to purchase another set or three; they are exquisite and beautiful, slide easily over the needles without snagging my yarn, and best of all, when I drop one I can easily find it again. To receive Christmas orders in time, please order no later than 12/19 and upgrade shipping to Priority Mail. Special discounted rate $4.50. I have had two tiny distractions from my workbench this past week. We found a litter of kittens in the flower bed. Momma cat left #CharleyandMinuet behind. They are thriving on every 4 hour feedings. And sleep deprived! Supervisor Emma is making sure I don’t slack off! I love to think about the knitting projects that these Serendipity Stitch Markers will be used for, hoping that they make the work in progress even more wonderful to work with! A work bench full of beautiful glass beads waiting to become Serendipity Stitch Markers! New stitch markers ready to be photographed and added to Knitter's Serendipity! My supervisor looks on as I create Stitch Markers and Jewelry. She is always ready for a treat. Gracie is counting the 32 Stitch Markers I needed in this shawl, a color for each section! From Bridal Veils to Stitch Markers? My goal is to design and make a stitch marker that is high quality, well balanced for ease of use and of course, snag free. 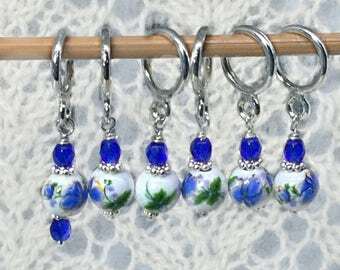 I dedicate the same detail to order and quality to Serendipity Stitch Markers as I have given to my Damselfly Studio bridal clients. Like many, I knit for relaxation and to get away from the world. I am most inspired by lace knitting. That I knit lace is rather a miracle, all things considered. Anyway. In another life, I designed Bridal Headpieces and Accessories. I still design and sell Bridal Accessories in another shop I have here on Etsy, DamselflyStudio. Because I designed bridal headpieces and have had an established jewelry line for almost 20 years, I had a LOT of beads. As a knitter, and one who loves knitting lace, you need a lot of stitch markers to help separate the pattern repeats of your project. A large shawl that has over 400 stitches can use a lot of markers, easily 25 - 30 depending on how many stitches are in each pattern repeat! The stitch markers that you generally find at the store are just plain ugly. Serviceable yes, but ugly. Then it hit me...why not make them? So, I got my pliers, wire and beads and started "fiddling" as they say where I am from. Eventually, I discovered that using my jewelry findings made wonderful, snag free bases to put on any drop that I could want. I had plenty of inspiration in my bead stash to get me started! I took the time to perfect which bead size, shapes and types worked the best for a stitch marker that handled easily with lace or other patterned knitting and that would not snag. My markers have had some testing by my knitting friends, as anyone in the knitting night group that lost a marker could depend that I had a few extra with me to come to the rescue! It was suggested that I sell these markers so after some final design finalization, organization, Knitting Serendipity has been born. In addition to markers, I plan to add Shawl Pins, Jewelry (so you can match your knitting, these are pretty enough to wear! ), Felted Floral brooches and who knows? I don't know all of the future yet. It is coming with Serendipity, to be sure. From Harrisburg, PA, AS in Fashion Design, Bridal Designer, jewelry designer, knitter and shawl, handbag designer, felter, happiest when playing with colorful things such as glass beads and wool or silk yarn. Lover of creatures with four legs. Abbie watches over my shoulder or from my lap, keeping an eye on production. Though I do catch her napping on the job. While often asleep on the job, she wakes up with a smile and a jolly wagging tail. For purposes of EU data protection law, I, Elizabeth Payne, am the data controller of your personal information. If you have any questions or concerns, you may contact me at Knitters_Serendipity@yahoo.com. Alternately, you may mail me at: Elizabeth Payne, 1002 W Hollywood Dr, Rushville IN 46173-2021 USA. Etsy's Calculated Shipping checkout program does not allow for multiple item shipments. I will manually compute shipping costs and refund costs over $1.00 to you. It is not fair for you to pay double the shipping when the cost may only be an ounce or a bit more! Yes! If you would like a set of combined sizes, colors or different quantity, contact me either through a listing or through the shop contact and I will set up a reserved listing for you. Yes! Please contact me. Wholesale prices available to established retail businesses. Your order will come in an organza pouch, wrapped in attractive printed tissue, tied with a ribbon. If there is anything else you need, please let me know. I am sorry, but I do not have boxes. If you need a multiple item order to be individually wrapped and tagged, just let me know! Yes! Color combinations can be ordered, custom set sizes, even jewelry! Just ask! Please note when paying by PayPal I am identified as damselflystudio. Thank you!